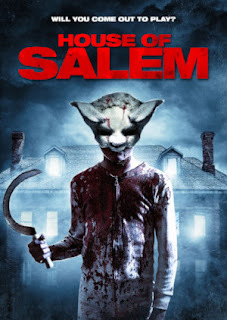 Realm of Horror - News and Blog: HOUSE OF SALEM comes to US VOD this Jan.
HOUSE OF SALEM comes to US VOD this Jan. The Devil Has A New Playground. Don’t Breathe meets You’re Next in writer-director James Crow’s ‘’brooding and compelling horror with a crime thriller twist”* HOUSE OF SALEM, premiering on US VOD this January from Wild Eye Releasing. A group of kidnappers become a child's unlikely protectors after discovering they have unwittingly been set up to take part in a satanic ritual. As they begin to uncover the truth of the house they find themselves trapped, they must battle demonic forces and uncover a legacy of over a hundred years of murder in the name of the Devil. Jessica Arterton, Jack Brett Anderson and Liam Kelly star in HOUSE OF SALEM, on US VOD 23/01/18 from Wild Eye Releasing. "Cannibal" - First Look poster released! Final trailer for Netflix BRIGHT released. Asylum of Fear - trailer released.